I want to offer a special thanks to all who read these words. If I don’t write again in the next few days, may you have a blessed Christmas. May your holiday be a great time with family and friends; may you have great joy in the Lord; may it be all about Jesus and all about God’s glory! Rick Warren has written a new book called The Purpose of Christmas. He explains the contents in his promotional video, which you can watch here on Amazon and in other places. His outline is great as far as it goes. Warren says the purpose of Christmas is three-fold, as given by the angels to the shepherds in Luke 2:10-14. First, the purpose of Christmas is Celebration. The announcement the angels brought was good news for all people – a reason to celebrate. Second, the purpose of Christmas is Salvation. The one who was born is called, by the angels, the Savior – he came to save us from our sin. And third, the purpose of Christmas is Reconciliation. The angels sang “peace to men,” meaning the peace of God in our lives, peace with God, and peace with each other. We can be reconciled to God because Jesus came to earth. Since Luke 2:10-14 is my passage for the upcoming Sunday message, I found it interesting to get Warren’s input. It is a great outline, however, it completely ignores the highest purpose of Christmas, the purpose to which all the others point. Christmas is all about God’s glory. Warren should have added that the fourth purpose of Christmas is Glorification. The emphatic part of the angels’ song is not “peace to men,” or “peace on earth,” but “Gloria in excelsis Deo!” Glory to God in the highest. Our salvation and reconciliation are great things to celebrate, and we are the blessed recipients of them, but ultimately salvation and reconciliation are not about us. They are, as I hope readers of this blog have figured out, all about God. This Christmas let’s join Rick Warren in celebration about salvation and reconciliation; but let’s not stop there. Let’s also join the angels in celebration, recognizing that Christmas is about Glorification. Gloria in excelsis Deo! Our satisfaction needs to be found in God alone. Forgive us, God, when we find pleasure and seek satisfaction in anything but you. We are addicted to the things of this world and have turned our backs on you. May we abandon the broken cisterns of our own making and find our satisfaction in your spring of living water. Fill us with joy in your presence; give us yourself as our greatest desire; help us delight fully in you. Psalm 92:12-15. “The righteous will flourish like a palm tree, they will grow like a cedar of Lebanon; planted in the house of the LORD, they will flourish in the courts of our God. They will still bear fruit in old age, they will stay fresh and green, proclaiming, ‘The LORD is upright; he is my Rock, and there is no wickedness in him.’” As I grow into middle age, this is a great prayer to bring before God. I never want to grow stale. I want to continue to be fresh and green and to bear fruit well into old age. I remember Chuck VerStratten, who in his late seventies had trouble walking, but was raising his hands and almost dancing before the Lord as a loud, contemporary worship team lead at a denomination meeting one year. I remember his sharp mind and optimistic outlook on life. I saw him continue ministry well after he supposedly retired. May I have that same freshness, fruit and optimism as I grow older. I have seen too many older people live from day to day with no eternal perspective, no ministry, no joy and no freshness. I don’t want to be that kind of person. Regardless of my physical and fiscal health, I want to pursue spiritual health – my relationship with God. May this psalm be my prayer before God, and may I find in Him my source of fruit and joy. 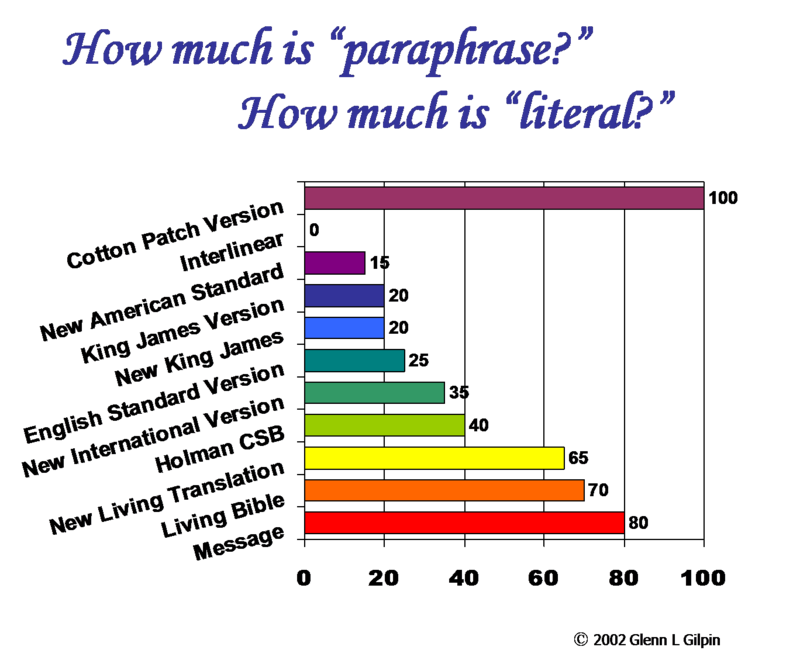 Here is a chart I made a few years ago concerning how much paraphrase and how much word-for-word literalness was used by various translations. I considered the Cotton Patch version as the most liberal paraphrase of all and assigned it a score of 100; and I considered an interlinear NT (a book where the English equivalents are typed between the lines of the Greek, with no concern for English sentence structure or word order) as a score of zero. Everything else would fall between those. Of course, this was a very subjective process, and I, in all my depravity, was the subject! Other readers might assign the scores in a completely different way than I did, and I might do the numbers different today, but this will give you an idea of where I place various versions of the Bible. Even if I changed the numbers, I would still keep the versions in the same order. A couple of notes to remember: First, we must consider what a translation team was trying to accomplish, whether they came near to accomplishing that goal, and whether that goal is legitimate for our purposes. In that light, I find the NASB (1995 edition) and NIV as the ones that best accomplished their stated goals. Whether those goals are legitimate depends on one’s perspective about translation theories and one’s purpose. Here your pastor and I might not fully agree; that’s why I preach out of the NIV and he out of the NASB. Though I like the NASB for study, I find the NIV captured our modern language better, is more widely read, and is thus preferred for preaching (another very subjective judgment). And even though I read out of it, I usually begin my study with the Greek, and I’m not afraid to state when I disagree with the NIV. Second, remember that more literal does not necessarily mean more accurate. Every “translation” has to have some “paraphrase” in it due to literary context, social context, figures of speech, etc. We talked about this on Sunday. At the same time remember that we believe in “verbal-plenary inspiration.” That means all the words of the original are inspired. And third, the fact that we can even consider such things makes us a very blessed people indeed! Christians in the majority of languages and through most eras of church history would consider themselves fortunate to have one copy of the Bible in their native tongue. Yet I have fifty different versions of the NT in English – and multiple copies of some of those! Let’s not forget the price people like William Tyndale paid to allow us that privilege! I had three thoughts related to this chapter. One was the scripture I’d read the same morning, Psalm 65. This chapter has a very similar idea in the early verses. “When we were overwhelmed by sins, you forgave our transgressions. Blessed are those you choose and bring near to live in your courts! We are filled with the good things of your house, of your holy temple.” All the riches of God are available to those he chooses, all the good things of his house and temple. Of course, one of the best things from God’s riches is his mercy to offer us the forgiveness of our transgressions! The second thought I had was related to today’s prosperity preachers. They teach that God’s wealth is available to his people, but they define that wealth in worldly terms rather than in godly ways. The wealth they present is, in comparison with God’s mercy, absolute poverty. First, it’s not the real thing, and second, it’s only temporary. Yet God’s real wealth is so much more valuable than anything they or this world have to offer, and it lasts forever. It’s as though they teach their followers to collect the plastic trinkets in the corner of God’s house when the most valuable of jewels are just across the room. The third thought is that the discussion in the paragraph above doesn’t speak just to prosperity preachers, but to all people. All of us seek treasure in things that are not God’s true riches. We are guilty of the same sins as the Israelites in Jeremiah 2:13, “My people have committed two sins: They have forsaken me, the spring of living water, and have dug their own cisterns, broken cisterns that cannot hold water.” Even with the best of riches and life –the living water – available in God, we seek riches and life in everything else – things that are stagnant in comparison. God, grant that we may find our true riches in the riches of your mercy.